Goodbye university. Hello working life. Well, that’s the plan anyway. Making the transition from student life to full-time employment comes with mixed emotions. Beginning your career might mean sacrificing late-night drinks on a Tuesday at the campus pub, but it comes with plenty of benefits. Just picture what you’ll do with that first paycheque. Graduating from university or college and finding a job is a significant life event. And people handle it in different ways. Some new grads will take their time and go traveling to forestall the change. Others will be keen to get their professional lives started right away. 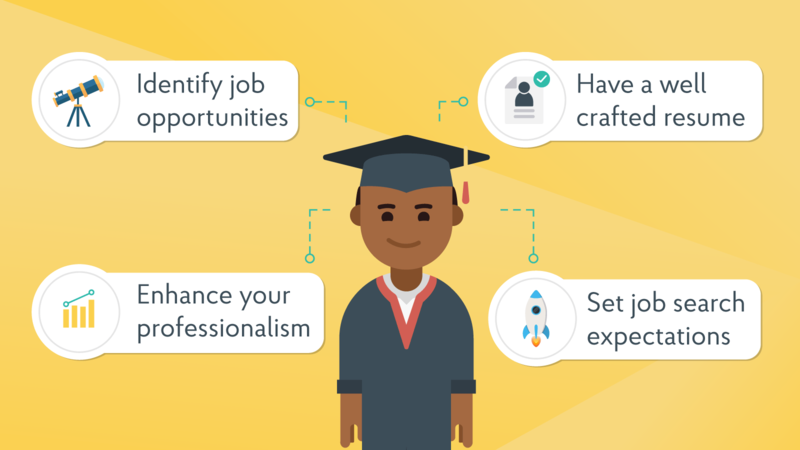 Regardless of when you plan on finding a job as a new grad, the process can be challenging. Many graduates lack familiarity with the basics of job searching, or how to sell themselves to employers when they have minimal work experience. OK, time for a reality check. Unless you are extremely fortunate, you will not find your perfect job right out of school. Sorry to burst your bubble, but it’s important to keep your expectations in check. This isn’t to say that you shouldn’t do everything you can to land a fantastic job. But you need to remember that there are thousands of other new grads out there looking to jumpstart their careers too. And there aren’t many ‘amazing’ jobs on offer to people who have minimal experience. You may find that there are limited opportunities on offer with your preferred company or in your ideal role. Be flexible in this case. Look for opportunities that vary slightly from these ideals. By all means, stay true to your interests and background. Just don’t be too narrow in your view of how you can apply your skills and experience. For example, you may want a financial analyst position with a commercial bank. Well, maybe that commercial bank isn’t hiring analysts right now but they are hiring project assistants. Chances are good that many of the skills required of a project assistant are required of financial analysts as well. And maybe you can start off as a project assistant, prove your abilities, and make a leap to an analyst. The point is to look for opportunities that are relevant to the career path you foresee for yourself. This may also mean pursuing unpaid internship opportunities as a potential starting point with a company or career path. Internships often lead to full-time, paid roles; and worst-case, an internship offers you valuable experience that you can use to help secure employment elsewhere. Before you start your job search, you had better make sure you have a resume or CV that you can send along to recruiters or other contacts. You won’t find too many organizations that don’t require you to submit one or the other as part of their hiring process. As a new grad, if you’re serious about landing a professional job, your resume or CV should look the part. So throw away that Word document you created five years ago when you applied for a job as a restaurant server, and upgrade to a modern version. You will want to give careful attention to layout and design so that you can make a visual impact on recruiters. A resume builder can help on that front. But even more important is the content you include. As a new grad, your best strategy for developing a resume/CV is to create an initial version that you can alter to fit the different positions you will be applying for. Don’t make the mistake of using the same resume/CV over and over again for every application. One of the basics of resume writing is to customize your resume/CV to reflect the requirements of a particular job description. In other words, you need to show recruiters that you’ve got what they are asking for. In terms of content, students and recent graduates can struggle to decide what to list on their resumes, especially if they lack relevant work experience. 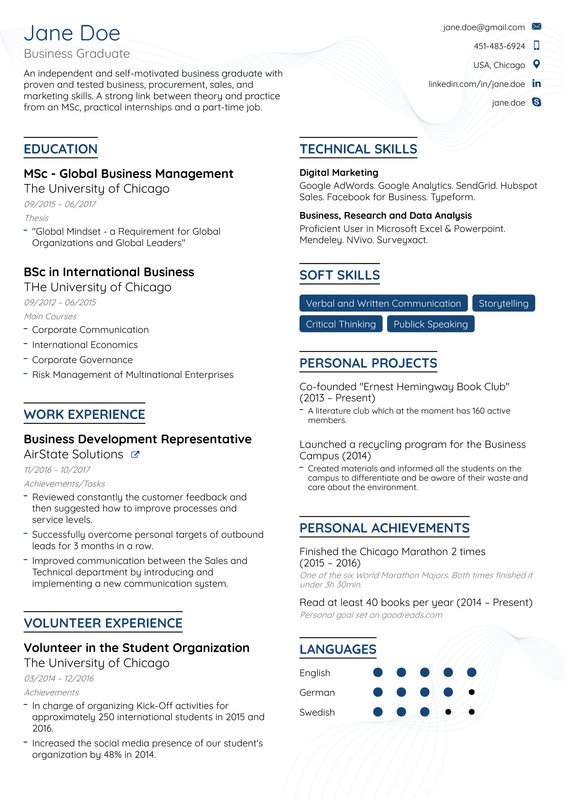 However, there are plenty of tricks for writing a resume with little to no experience. What’s important is that you think hard about how other experiences, such as school work or extra-curricular, demonstrate the abilities you can apply to real-world work. Once you’re equipped with a resume or CV, the battle of finding a job opportunity begins. One of the most common mistakes new grads make when searching for work is relying strictly on online search. Yes, many companies post jobs on their own websites, and these jobs get aggregated on sites like Indeed or listed on LinkedIn. However, what you find online represents just a fraction of the jobs out there. A lot of companies choose to hire new people through referral channels or word of mouth. Plus, the process of searching and applying for jobs through online applications can be tedious. There is a more efficient way of going about it, and it’s called the “disruptive job search”. The idea here is that you research the companies or positions that interest you, and then identify a networking path that will lead you to that job. In other words, you bypass the online application process by proactively connecting with employers. Every new grad needs to harness the power of networking as part of their job search. By building relationships you will get your name and aspirations known by people who can help you get the job you want. Wondering how to network? Well, a good starting point is to identify people you already know who work in the industry that interests you. If you’re lucky, your personal contacts will lead you directly to a job prospect. Otherwise, you may have to push your comfort zone a little farther and approach people who don’t know you already. You can find with these people in person – for example, by attending industry events – or by doing some digging online. You’re not looking for HR managers or recruiters necessarily, though you may want to still contact these people to discuss job opportunities. Instead, you’re looking for people who are well-positioned to offer you information on a particular career and have their own powerful network that you can get access to. Let’s call these people “connectors”. Once you’ve found a connector, your next step is to try to get his/her attention. This takes a bit of courage, but it’s as simple as introducing yourself, explaining that you are getting started in your career and would like to learn more about the line of work. You then ask whether they would be willing to have a short 15-20 minute chat about their own experiences in a certain profession. This is what is called an “informational interview.” As the name suggests, this interview isn’t about asking for a job, it’s about getting information that can help lead you to job opportunities. They are best-done in-person at a time and place that is convenient for your contact, although a phone call work too if that’s all they can offer you. Be strategic with the short, precious time you have for your interview. Don’t ask about where your contact went to school or about his/her job description – information that is probably readily available. Instead, ask questions that give you a real insight into what it’s like to work in that field, including the skills and experiences that are considered the most valuable. From here, you may be directed to a variety of other people that you can have further informational interviews with, or your contact may offer to refer you directly to someone who makes hiring decisions. Regardless of the outcome of these informational interviews, you will be left with plenty of insights into how you might improve your attractiveness as a job candidate. And you will have a network of people who will keep you in mind for jobs that come up within their company or industry. Since you are no longer in university, and you want a professional job, it’s time to look and play the part. That means being extra conscious of the image you project, particularly online. You can be certain that as you go about networking and connecting with recruiters, they will be looking you up online. We’ve talked a lot before about how to use social media to find a job, so definitely harness its power as part of your job search. But be very careful with the content you leave open for public access. Before you start circulating applications to organizations, do a full audit of any of your online profiles and review your privacy settings so you know what potential employers might be seeing if they search your name. While you’re at it, why not upgrade your LinkedIn profile with the content you’ve developed for your resume or CV? A professional headshot is a must-have for LinkedIn too. One final point: try not to let the job search overwhelm you. It’s easy to feel torn by the many potential paths you can pursue as a new grad. And watching friends around you find jobs may up the pressure on you. Just remember that this is just the start of your career, and chances are high that you will switch jobs multiple times over the course of your working life. Think hard about the types of jobs you think are fulfilling, learn as much as possible about them, and once you’re confident that you’ve found the right fit, follow the advice above and start working your magic. Good luck!